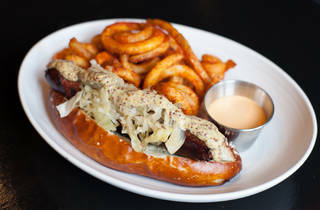 Heritage knocks caviar off its mother-of-pearl pedestal with accessible pricing and easygoing atmosphere in Bar Marta's old digs. I distinctly remember overreacting when the dining wires broke the news this summer that Chicago’s first caviar bar would open in the bygone Bar Marta space in Humboldt Park. “There goes the neighborhood,” I whined. But this salty delicacy isn’t just a status symbol of the rich. 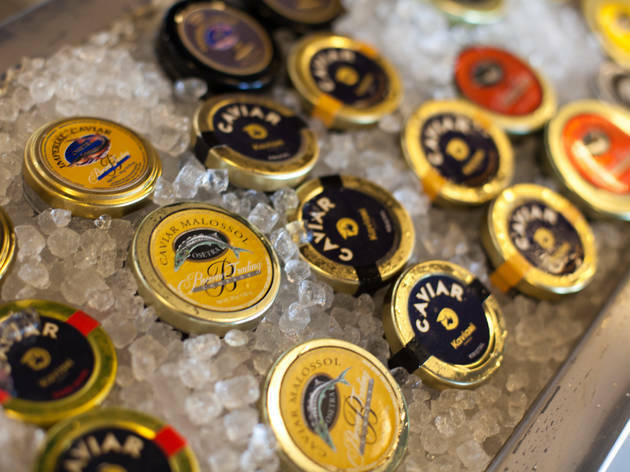 Caviar has a long tradition as the preferred nosh of working-class Russians and Eastern Europeans—one they brought along when they immigrated to the States. During the 19th century when North America was producing a glut of sturgeon for European export, beluga caviar became a staple of Chicago saloons, mostly as a salty gimmick to encourage drink sales. 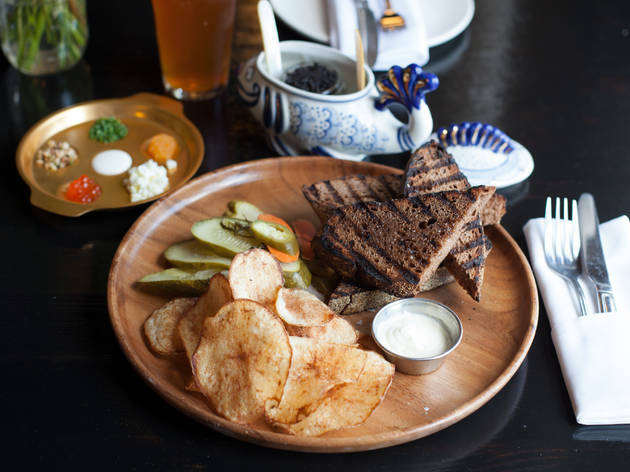 It’s in this everyman’s spirit that Heritage executive chef/president Guy Meikle (formerly of Bridgeport café Nana Organic) hopes to dismantle our monocled preconceptions and bring caviar back to its proletariat roots as something to wind down with alongside a nip or two. Overly complicated menu aside, this inviting corner joint has the potential to become a real neighborhood staple. It was already dark when I approached the familiar brick storefront at Chicago and Washtenaw avenues. Heritage’s main dining room isn’t all that different from its predecessor’s, save for the addition of a large back booth and caviar bar, plus a noticeable uptick in tchotchke shelves. 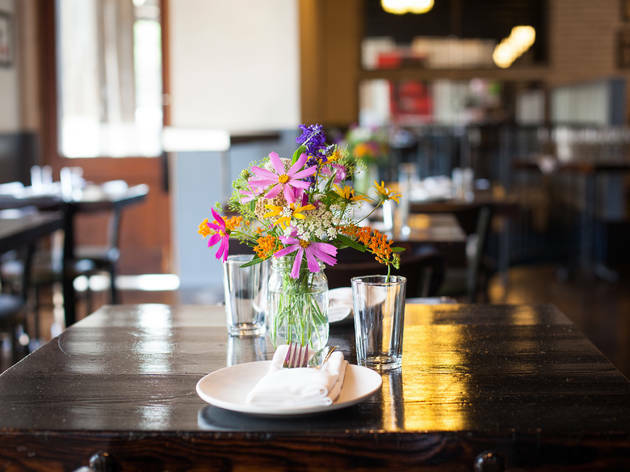 Whitewashed brick walls and thickly lacquered low wood tables recall a timeworn New England seafood shack. Opposite the long marble bar heaped with oysters and roe on ice, wispy gauze curtains break up a wall of windows that was previously obscured. The lush, cocoon-like downstairs parlor got a major overhaul, with new floors and ceilings and a beefed-up bar. 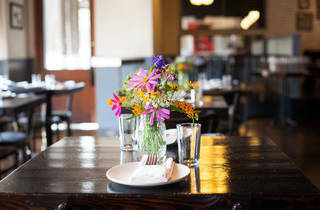 Before leading me to the table, the server spent a good minute gathering my reading materials—a tabloid-sized dinner menu, trifold caviar and beverage list and two napkin-sized leaflets bearing the casual dinner and happy hour offerings (“Still for 30 more minutes,” she told herself as much as me). Immigrant-homaging dishes traversing everywhere from Mexico to Poland, Korea and the American south populate the ambitious all-day menu. I anxiously leafed through the stack once before deciding I would rely on the server for all my decisions. To drink I went with her suggested Best F%@&ing Fall Gimlet, a quenching, Chinese five spice-imbued version of the limey gin summer throwback, stained with bittersweet drops of amaro. GM/beverage director Jan Henrichsen smartly tweaks the cocktail list with the seasons. In my date’s bourbon sipper, the Last Time You Called #2, she traded strawberry-maple and apple bitters for deeper, autumnal black-spiced vermouth and chocolate bitters. 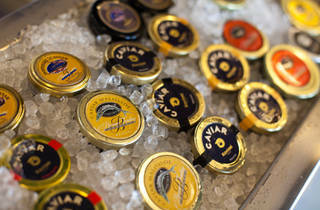 With drinks in hand, it was time to talk caviar. 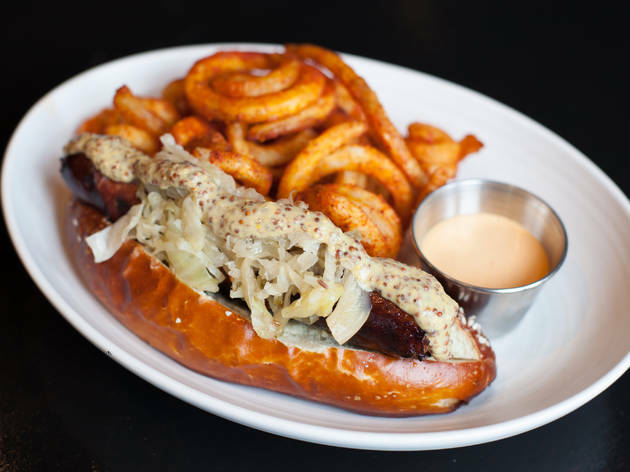 Heritage peddles the stuff for as little as $10 per serving, but if it’s your first visit and you have a date or two in tow like I did, go for the grand platter. 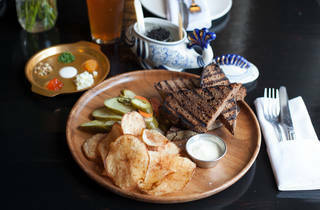 It starts around $50 and includes a 12-gram mound of caviar (plus bonus Michigan whitefish roe and tobiko), pastry chef Alan Krueger’s subtly sweet Russian black rye toast painted with butter, sturdy house-fried potato chips, pickled veggies, sour cream, softened butter, and traditional minced accoutrements (eggs, red onion, chives and capers). I sampled the slate-colored, German imperial caviar on its own first—pressing a spoonful to the roof of my mouth with my tongue until the eggs popped—its mild creaminess giving way to a nutty aftertaste. My dates and I spent the next hour methodically building our perfect caviar bites over and over while we sipped our drinks, griped about work and passionately debated everything from weighted blankets to the new dumpling emoji (“It’s an empanada,” one friend insisted). A few hearty two-biters broke up our routine. Toothsome pelmeni stuffed with dill, caramelized onions and sherry-scented beef hearts were draped in a brawny sauce of reduced veal stock, celery root and bone marrow and dotted with orangey chanterelles. Rockefeller-style grilled oysters bathed in herby butter beneath a decadent canopy of chewy bacon lardons, milky-hued snail caviar pearls and a barely-set quail egg. I’d all but forgotten we were at a restaurant when our server dropped by a third time to gently ask for our entree order. I checked to make sure I hadn’t kicked off my shoes under the table. Teetering on full, we gravitated toward the tender seared scallops nestled atop sweet caraway-carrot puree dotted with tangy fermented eggplant and pickled mustard seeds. A greasy, deeply smoky goulash that followed rendered me almost comatose: Fatty spare ribs were braised in smoked pork stock until they took on a bacony flavor, alongside rich pork, duck and turkey meatballs, all drenched in a thick veal and roasted onion gravy seasoned with a heavy hand of smoked paprika. 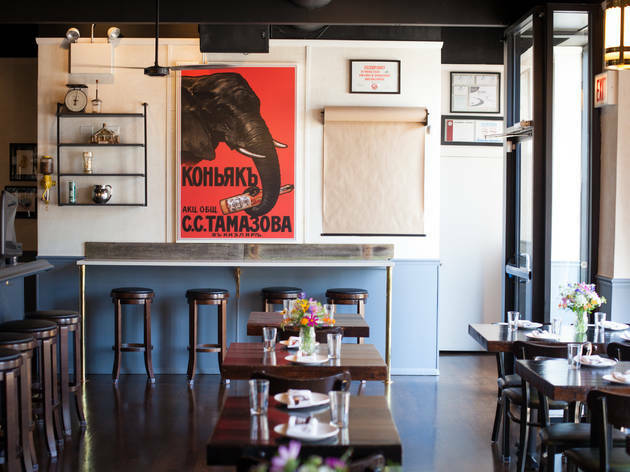 Atmosphere: With a casual vibe and wide-ranging all-day menu headlined by a dressed-down take on caviar, this inviting corner joint has the potential to become a neighborhood fave. What to eat: A la carte caviar starts at $10, but if you’re in a group, go for the platter, which is outfitted with generous sides. Don’t skip the toothsome pelmeni and grilled Polish sausage roll, and save room for oft-changing, always comfy pie and ice cream. 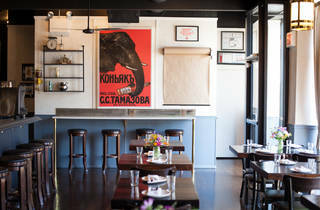 What to drink: Seasonally rotating infused vodkas like lemon-basil and blueberry or black pepper gochujang are a match for the plethora of pickled items and sea creatures on order here. Eighteen (!) food-friendly wines by the glass span France, Germany and more interesting locales like Croatia and Slovenia. 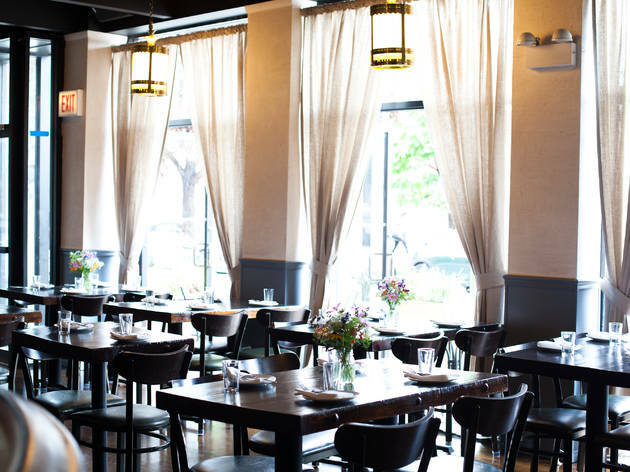 Where to sit: Bellying up to the bar allows you to ogle the oyster and caviar on offer, or request the plush, 10-person corner booth if you’re bringing a crowd. Come winter, the downstairs parlor is a luxe and cozy escape. Love this place. Live in the neighborhood and have been there several times (both brunch and dinner) since they've opened. I love the ever-changing menu. There's always options for fancy or casual depending on what kind of meal I'm up for. I also appreciate that there's vegan and vegetarian options for my friends. Everything is baked/smoked/cured/etc. in house! 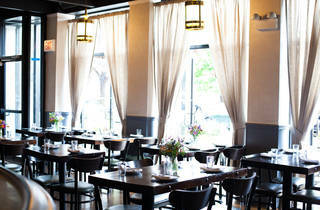 The food has been amazing every time, and the service is attentive, friendly, and welcoming. Totally unpretentious, but absolutely on point. Their wine beer and cocktail offerings are varied and approachable (and the signature cocktails are wonderful). They even do seasonal house infused vodka which they have on tap! There's a pastry chef in-house, so all of the breads, noodles/dumplings, desserts/ice cream, and brunch donuts/kolachkis/sweets are all homemade on premises daily. I've even been in their 'Parlour" downstairs for a private event - a whole additional full bar and dining area that is very warm and cozy. Never had anything less than a wonderful time.